You are at:Home»Events»Marconi Inland Keelboat Championships 2018 – Enter Early! April 14th is the date set for Marconi’s start to the 2018 keelboat racing series. 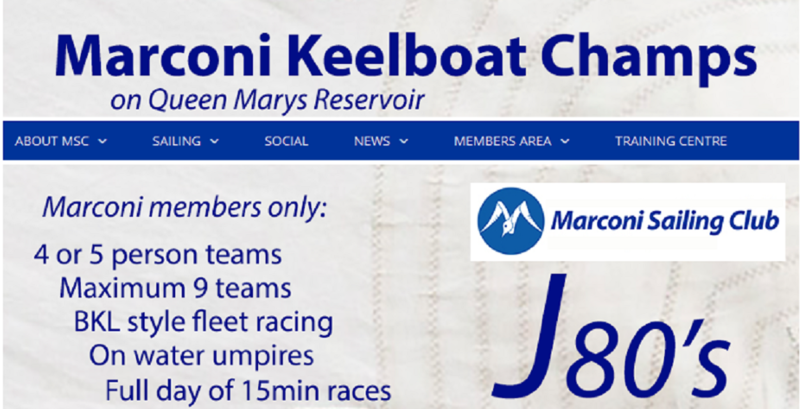 Next season we’d like to offer a greater number of Marconi members the opportunity to participate in the exciting racing format of the British Keelboat League. In order to do that we have teamed up with the Royal Thames Yacht Club, one of the key drivers behind the increasing interest in this form of racing in the UK, and have pre-booked the clubs fleet of J80’s that are afloat at Queen Mary’s reservoir near Staines. As part of the collaboration the Royal Thames have agreed to provide the race officers and umpires to run a full day of 15 minute, windward leeward races that will culminate in the crowning of the Marconi Keelboat Champions of 2018. The event is open to teams made up solely of club members and we’re able to have as many as 9 teams doing battle throughout the day as we’ll be swapping out boats and crews to ensure that every team sails each boat, against all the other teams. What a great way to start the 2018 season, strong competition on the water and quite a bit of banter in the club house afterwards. 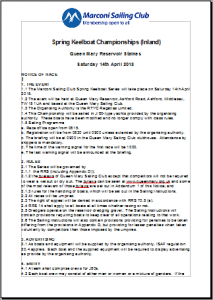 The Sailing Instructions can be downloaded here. But don’t wait until the Spring to put your team together, we need to firm up the booking with the Royal Thames by Christmas. Skippers / Team Boss’s can build a team of their choice, so we’re expecting some pretty strong haggling, persuasive tactics and inducements offered, to come into play during November and December as teams are formed. 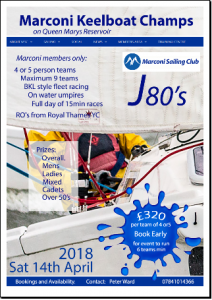 We’ll have prizewinners for the cadet team, ladies, over 50’s, mixed and mens as well as the overall champions, and what’s more, we’ll be taking the results into consideration as we once again select sailors to compete for a representative place in Marconi’s team for the 2018 British Keelboat League. Answer: If you’re a potential skipper / team boss, then start chatting up your preferred crew members and get them to commit. Once you have your team, register it with the organiser (Peter Ward). If you’re an individual who would like to participate, let the organiser know, so that we can make the potential skipper / team boss aware that you’re available. We can guarantee that this will be one of the most exciting days of sailing organised by the club in 2018, so get your name on the list before the places are all gone!